This is as autobiographical as it gets. Nice to see the flipped calculator trick is still being done after all these years, awesome. Cheers! He showed her his tan lines. Now that they’re off to multiply hopefully they’ll practice safe six and not end up with a binarial disease. 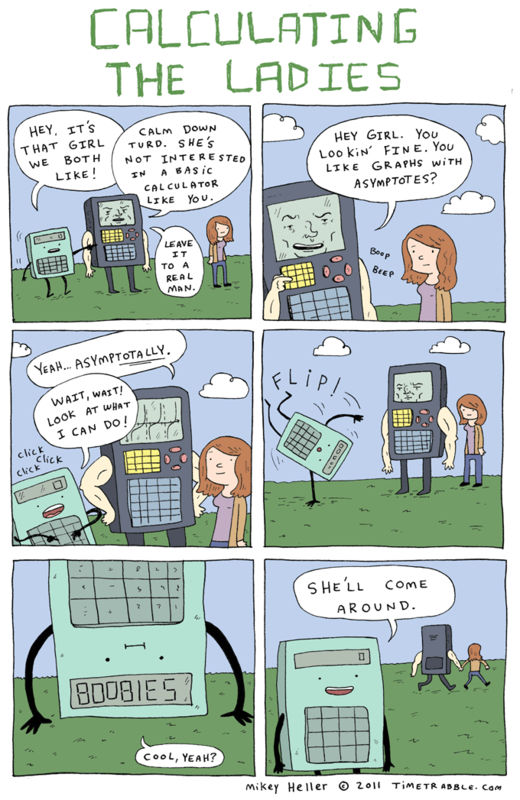 I bet the scientific calculator had a reeeally deep voice. Just found this site today whilst Stumbling, (the one with the Hacking). Wicked funny. Like, evil. It ate my cat. This is awesome. I love your comics Mikey. Calculators don’t need girls. 🙂 Or do they?